einer der einflussreichsten Politiker während der Zeit des Nationalsozialismus und einer der engsten Vertrauten Adolf Hitlers (1897-1945). Albumblatt mit eigenh. Unterschrift. Berlin. 8vo. 1 p.
German politician and Reich Minister of Propaganda in Nazi Germany (1897-1945). Collection of early autograph manuscripts, letter drafts and documents. 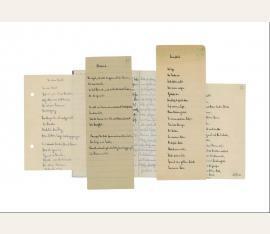 Large collection of authentic material relating to one of Adolf Hitler's closest associates. Comprising in total: I: Goebbels's natural science college notebook. C. 1919, in pencil and ink, signed within eight times "Goebbels". 8vo. 52 pp. - II: Goebbels's high school maths workbook. C. 1918. 8vo. 60 pp. Goebbels has written his name on the title page and filled the book with mathematical equations and logarithms, precisely written in pen and pencil. 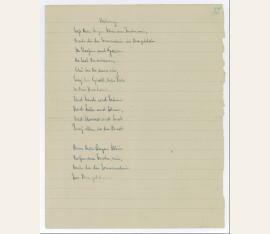 - III: Goebbels's registration book for classes he took at the Julius Maximilians University (Würzburg) in the winter semester of 1918/19. 8vo. 24 pp. Goebbels has signed his full name on the cover, along with his city of residence and his course of study ("Germany Studies"). Within, he lists the classes taken, professors' names, and class fees. 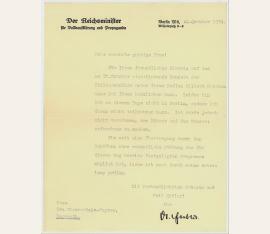 - IV: Typed letter signed from his father Fritz Goebbels. Rheydt, 14 Nov. 1918. 1 p. 4to. 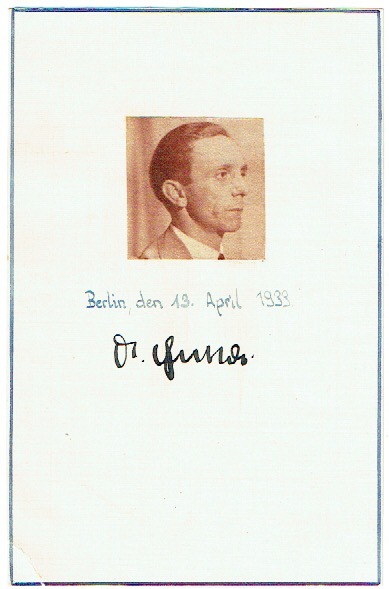 On the verso of the letter, Goebbels, at the time drinking heavily, has signed his name 28 times as "Goebbels", seven times with his familiar "Ulex Goebbels", and seven times as "Ulex". - V: A page from Goebbels's college workbook. C. 1917. 1 p. 8vo. 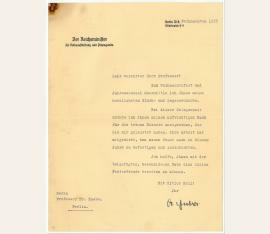 In pencil, signed 11 times across the text "J. Goebbels", with a full signature "Joseph Goebbels". - VI: Manuscript poem. 11 July 1920. 1 p. 205 x 81 mm. Unsigned, titled "Husaren Abschied" ("Hussars' Goodbye"). - VII: Four pages from Goebbels's maths workbook. C. 1917. 8vo. 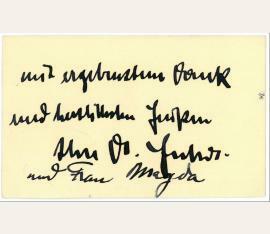 Signed seven times "J. Goebbels". The pages contain mathematical equations and formulas, with the balance dedicated to describing a festive dinner party with his friend "Koelsch", most likely Karl Heinz Koelsch, and describing a "beautiful girl". - VIII: Autograph poetry manuscript. 23 April 1923. 1 p. 8vo. Unsigned, titled "Bei Nacht" ("By Night"). - IX: Autograph poetry manuscript. C. 1920. 1 p. 8vo. Unsigned, titled "In einer Nacht" ("In a Night"). - X: Autograph poetry manuscript. C. 1920. 3 pp. 8vo. Unsigned, titled "Der Mutter Wiegenlied" ("A Mother's Lullaby"). 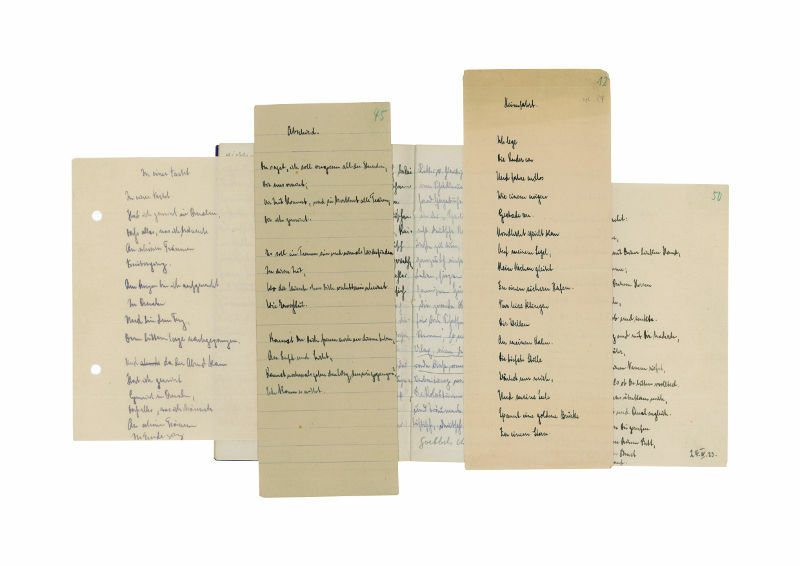 On the verso is a second poem. - XI: Autograph poetry manuscript. C. 1920. 1 p. 205 x 73 mm. Unsigned, titled "Abschied" ("Farewell"). - XII: Autograph poetry manuscript. C. 1920. 1 p. 205 x 73 mm. Unsigned, titled "Heimfahrt" ("Journey Home"). - XIII: Autograph poetry manuscript. C. 1920. 1 p. 8vo. Four verses, four lines each, entitled "Thule" [?]. 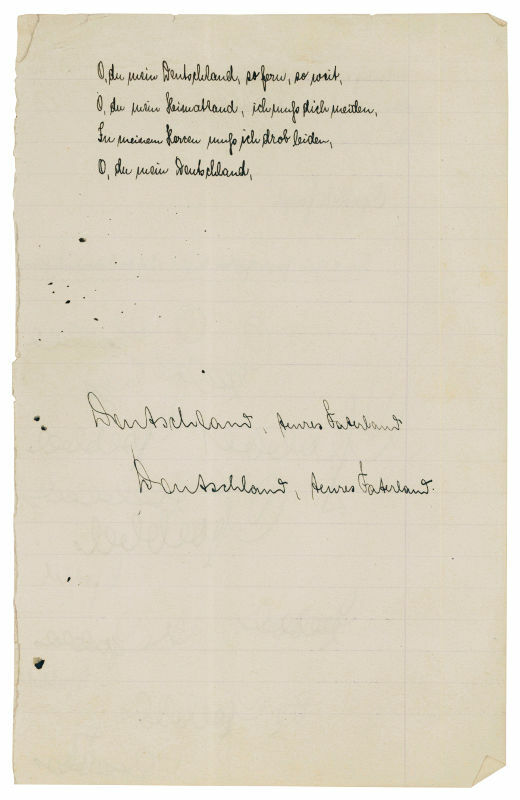 On the verso, Goebbels writes a draft letter to "Ingo" (24 July 1918), discussing a permit or form. - XIV: Autograph poetry manuscript. C. 1920. 1 p. 8vo. Unsigned, titled "In vielen Naechten" ("In Many Nights"). On the verso, are several lines of personal notes, signed "D. U. ", probably also by Goebbels as his familiar "Ulex". - XV: Library card issued to Goebbels. C. 1919. 1 p. 8vo. Signed by a university official. 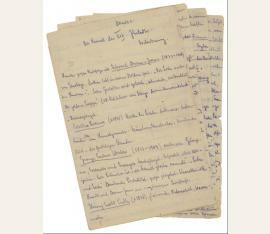 Goebbels has added ten lines of study notes on the verso. - XVI: His very early familiar signature and interesting addition: "Ulex Goebbels from the little child". On the 36mo cover of a 1920 calendar cover page. 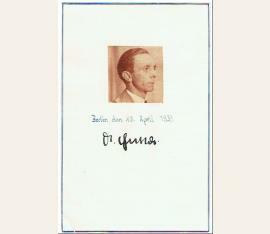 - XVII: Goebbels's report card from his first trimester. Rheydt, 5 August 1913. 1 p. Small folio. Signed by his head master and teacher, Goebbels shows his proficiency in Latin, Algebra, and French, while declining to study Hebrew. Also signed by his father "Fritz Goebbels" at the bottom. - XVIII: Goebbels's senior year report card. Rheydt, 7 April 1916. 1 p. Small folio. 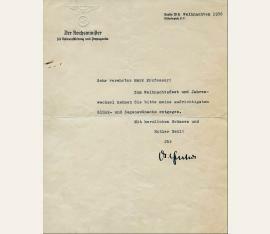 Signed by his headmaster and teacher..
NS-Politiker und Reichspropagandaminister (1897-1945). "O du mein Deutschland". Autograph poem manuscript. O. O. 4 Zeilen auf 2 SS. (1 Bl). Gr.-8vo. "O, du mein Deutschland, so fern, so weit, | O, du mein Heimatland, ich muß dich meiden, | In meinem Herzen muß ich drob leiden, | O, du mein Deutschland". 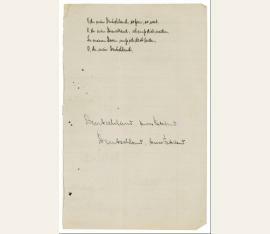 - The reverse with another poem (3 lines, crossed out repeatedly) and 13 exercises in writing "Goebbels" fluently. - Edges slightly frayed. NS-Politiker und Reichspropagandaminister (1897-1945). "Ins Tagebuch" and "Mahnung" ("Into the Diary" and "Admonition"). 2 autograph poetry manuscripts (12 and 15 lines). Heidelberg. 2 SS. Kl.-4to. The first poem is describing what has to be written into a diary ("a little bit of lust [...] a little bit of play and dance"), the second uses "eyes" metaphorically for "windows" through which the sunlight enters the heart: "In streets and alleys you are alone [...] carry your luck and your pain in your heart [...] and happiness and dreams and love and pain and lust [...] carry it along in your chest [...]. - Somewhat dusty, edges slightly frayed, otherwise in fine condition. NS-Politiker und Reichspropagandaminister (1897-1945). Ms. Brief mit eigenh. U. Berlin. 1 S. 4to. 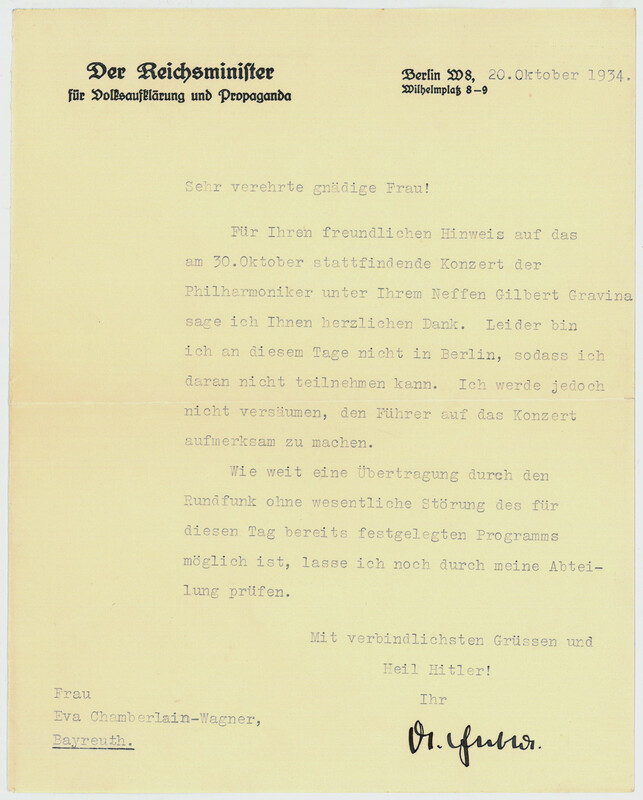 An Eva Chamberlain mit Dank für eine Konzerteinladung: "Für Ihren freundlichen Hinweis auf das am 30. Oktober stattfindende Konzert der Philharmoniker unter Ihrem Neffen Gilbert Gravina sage ich Ihnen herzlichen Dank. Leider bin ich an diesem Tage nicht in Berlin, sodass ich daran nicht teilnehmen kann. Ich werde jedoch nicht versäumen, den Führer auf das Konzert aufmerksam zu machen. Wie weit eine Übertragung durch den Rundfunk ohne wesentliche Störung des für diesen Tag bereits festgelegten Programms möglich ist, lasse ich noch durch meine Abteilung prüfen [...]". - Auf Briefpapier mit gedr. Briefkopf des Reichsministers für Propaganda und Aufklärung. Joseph Goebbels (1897–1945), NS-Politiker. Ms. Brief mit e. U. („Dr. Goebbels“). Berlin, Weihnachten 1936. ¾ S. 4°. – An einen namentlich nicht genannten Professor: „Zum Weihnachtsfest und Jahreswechsel nehmen Sie bitte meine aufrichtigsten Glück- und Segenswünsche entgegen [...]“. – Auf Briefpapier mit gedr. Briefkopf des Reichsministers für Volksaufklärung und Propaganda und gepr. Reichsadler; mit kleinen Läsuren am linken und einem kleinen Einriß am rechten Rand sowie einer kleinen Rostspur. "Die Kunst des XIX. Jhdts. Fortsetzung". Eigenhändiges Manuskript. 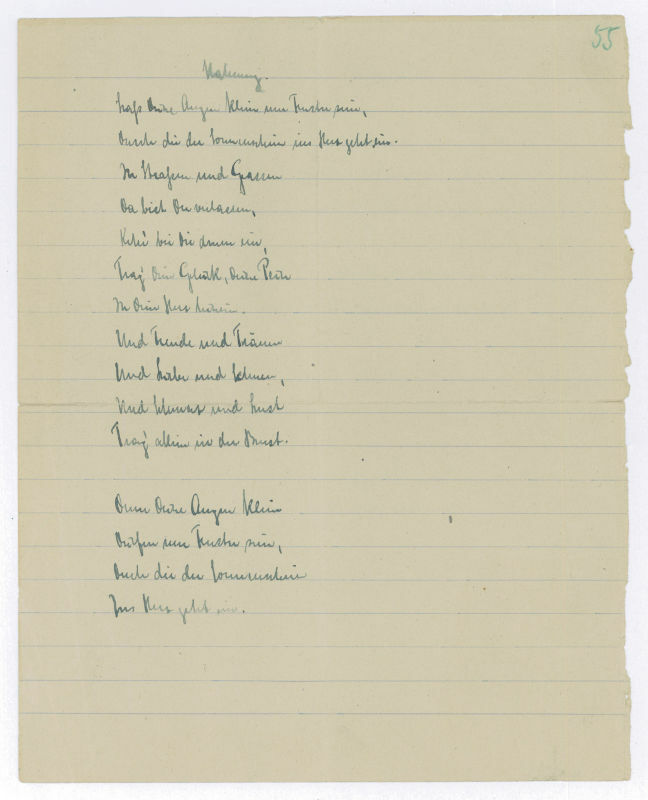 Presumably written during his studies at Bonn, Freiburg, Würzburg, München, and Heidelberg, Goebbels's manuscript gives an outline of the history of the graphic arts, beginning with the second half of the nineteenth century, and ending in the early twentieth century ("der neue Stil ist der Expressionismus" [the new style is expressionism]). - Punched holes in the left margin (slightly touching text), in pencil. Eigenh. Visitenkarte mit U. von Joseph und Magda Goebbels.